The latest edition to the Irrigatia range, the SOL-C120 waters up to a massive 120 Irrigation Units (IU's). The kit includes a C120 SMART controller with integrated irrigation pump as well as a secondary pump for mixing plant feed in-line during the watering process. The C120 comes with a 25m length of 13mm pipe backbone to which Irrigatia extension kits can be connected using the included 4mm punch and joiners. The C120 requires 20 x AA rechargeable batteries which are included. 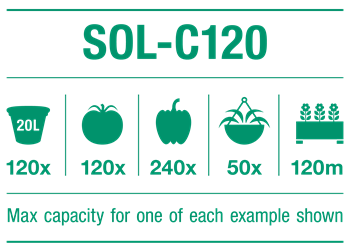 The SOL-C120 is suitable to irrigate one of the stated maximum planting quantities, or a combination thereof.